What is OMNIPCX ENTERPRISE COMMUNICATION SERVER (CS)? Architectural flexibility – which enables centralized or decentralized IP configurations, a choice of IP, IP/TDM or TDM, minimizing additional investment and enabling a smooth migration at your own pace, when and where it makes financial sense. The Alcatel-Lucent OmniPCX Enterprise features a native SIP controller that provides an unmatched level of services on in-house or third party SIP phones, including a full third party call control from applications. Simplified management – because the same network management software is used across the enterprise, independent of the underlying infrastructure. 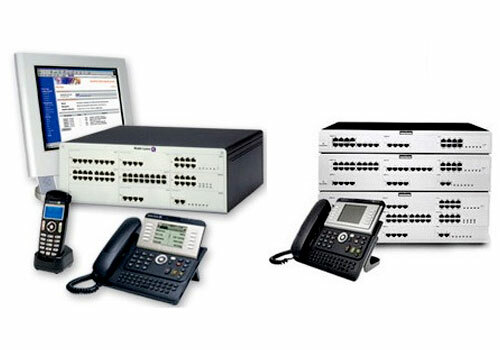 The Alcatel-Lucent OmniVista™ Network Management System is a single, open management platform designed to manage and control a global, OmniPCX IP communication solution. Intelligent networking – reducing the cost to support all users at different sites. For instance, feature transparency across servers, or advanced route selection (ARS) is available from any site without having to duplicate the software at each site. A single image across fully networked servers provides simplified management of large and very large configurations. Openness , interoperability and integrated solutions – the OmniPCX Enterprise integrates open standards and state-of-the-art technologies to provide a very flexible solution. Alcatel-Lucent helps maximize customer investment returns by simplifying the interworking and integration of its solutions within existing or future communication environments. This is supported by hundreds of applications validated through the Alcatel-Lucent Application Partner Program (AAPP).